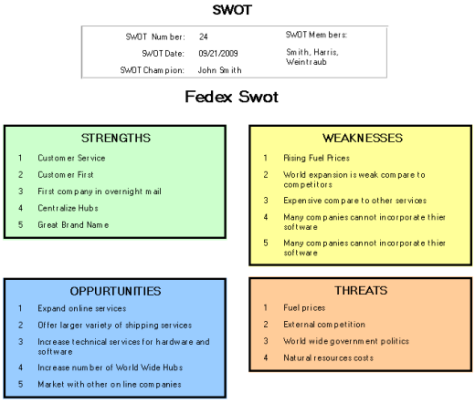 Fedex Swot - Here is an Example. This FedEx SWOT reveals several things about the company. When the FedEx Corporation began in 1973 who knew that they would eventually get to the point where they now? They own nearly 50% of the market share in ground shipping in the United States. Companies that are on the right track when it comes to planning in the right market are usually a household name, and this seems to be the case with FedEx. FedEx increased revenues just about every year that they have been in business. With a sales track like that and when it comes to shipping and overnight deliveries, it's no wonder that they are truly better than their competitors. One of the major strengths that FedEx has going for the company is their slogan and message that they want to get across to consumers. The People-Service-Profit attitude and motto indicates that they place their customers as first priority. This instantly gains trust with consumers. Oppositely, FedEx's competitors may not keep this business model in mind and may lack when it comes to customer service. FedEx was essentially the first company to develop such an idea as express delivery. Today, they are unmatched by even the United States Postal Service in terms of being able to carry out their operations on time as well as customer service. Since FedEx is generally credited with owning the idea of express delivery services, they are generally held to a higher standard and turned to more often than other companies. From a customer's point of view, the rising prices of FedEx services are a major downside. Even though the FedEx Corporation thinks that their customer's are getting a superb value, it is ultimately the consumers who hold this same opinion for FedEx's business model to sustain. In addition, FedEx could lose revenues and annual sales if prices keep climbing and customers start seeing other brands that have more potential. The internet should be used as a huge advantage to FedEx. The online shipping market has grown rapidly within the last 5 years alone and will only continue to soar! FedEx needs to offer more options to consumers who want to conduct all their shipping needs online. FedEx should consider contracting with other online companies that use shipping services to gain brand recognition and trust! The major threats to the FedEx business model are the other major competitors within their market segment. For example, BAX Global and DHL are two services that also experienced continued growth in these years. Since those companies have the same majority of services that FedEx does, it would be easy for FedEx competitors to use a competitive advantage such as a proprietary product or service that has more potential than FedEx services. As you can see from this free Swot, the FedEx Corporation is doing well and, despite the economic slowdown, keeps turning a profit. This is because FedEx is based on a sound business model. Customers always need packages and belongings shipped in any economy, and the company has done an excellent job so far at dominating the market share!